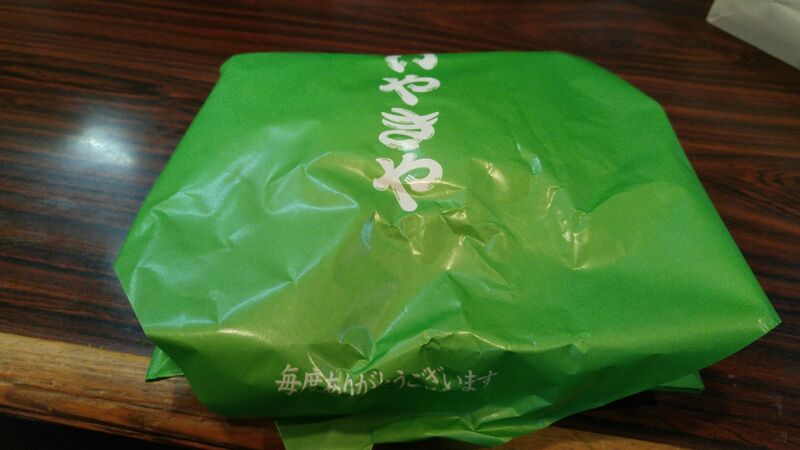 Matcha Tea Taiyaki, Oden & Yakisoba at Taiyakiya in Ieyama, Shimada City! Equipment & facilities: Old but very clean. Excellent washroom. 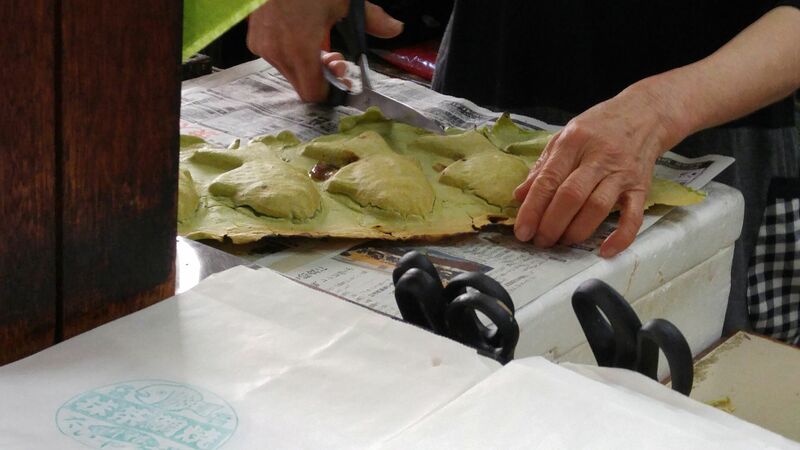 Strong points: Matcha Tea Taiyaki, Shizuoka-Style Oden, Yakisoba, Ramen. Many visitors, local or tourists, make a point to stop at Ieyama Station along the OOi River Railway Line for many reasons. 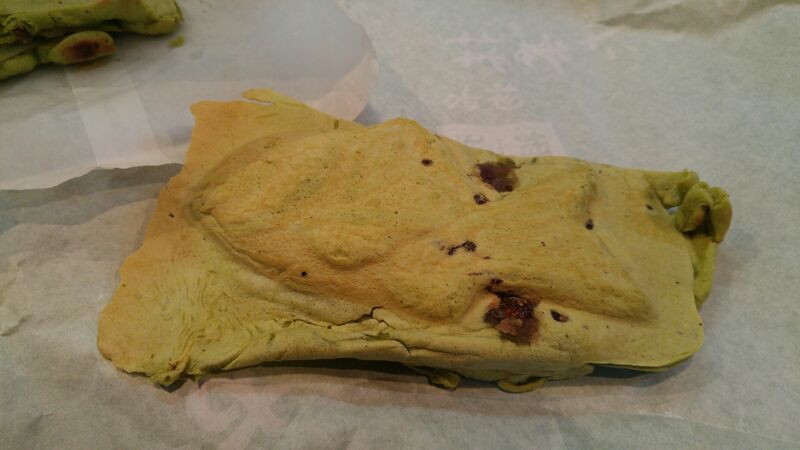 One of them is a place where they make rare taiyaki with a dough mixed with local green tea matcha powder. 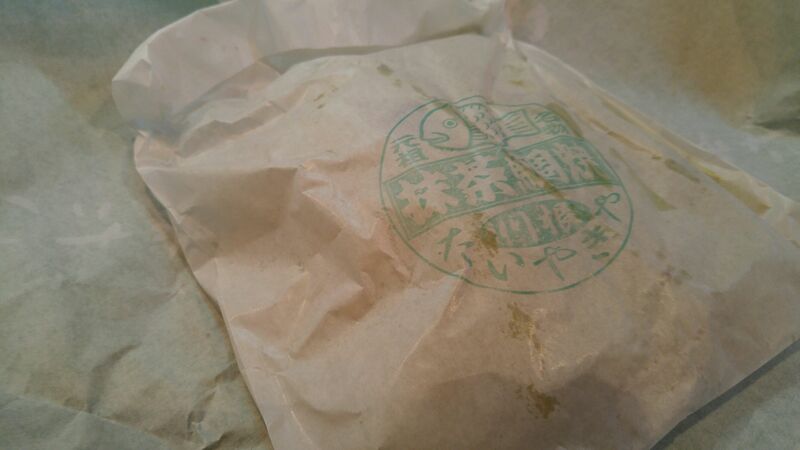 Incidentally the region is famed all over Japan for its green tea! 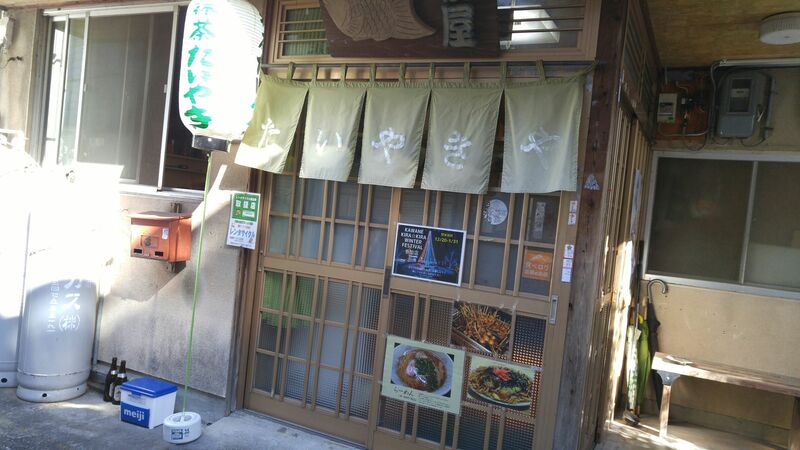 Taiyakiya takes years back into old Japan. 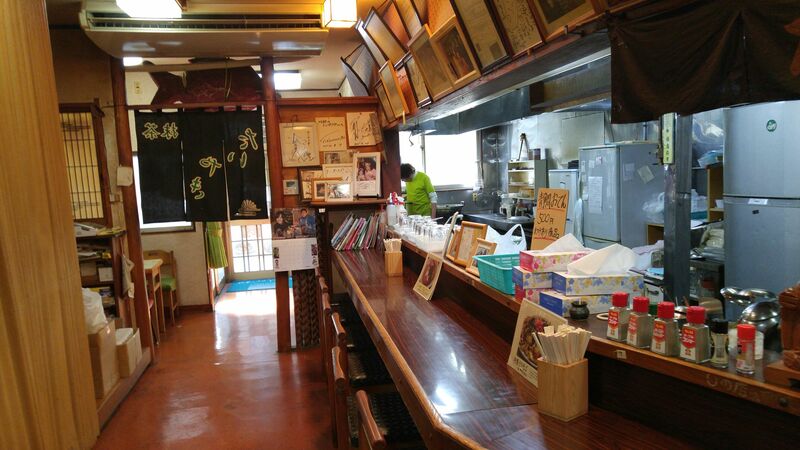 It is more than 50 year old in any case, although the washroom has been renovated. 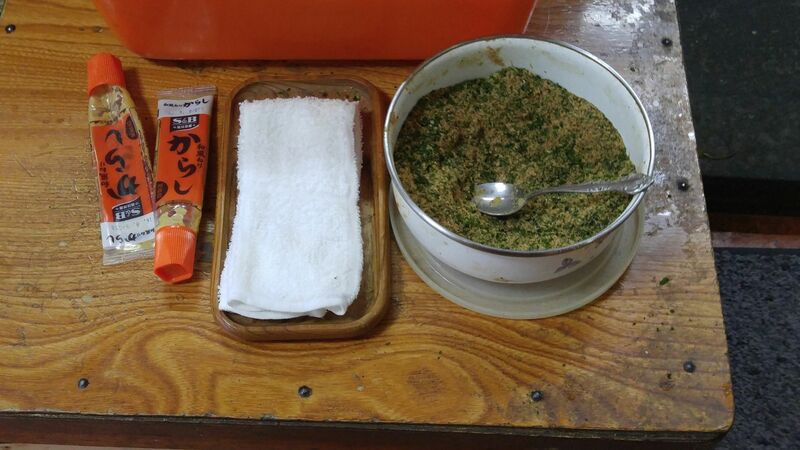 As for the rest it is typical Japan of the 1960’S! The owner, a second generation, must be the most photographed local personality as TV from as far as Tokyo come for regular shows! He and his wife are a bit shy but so kind and attentive! 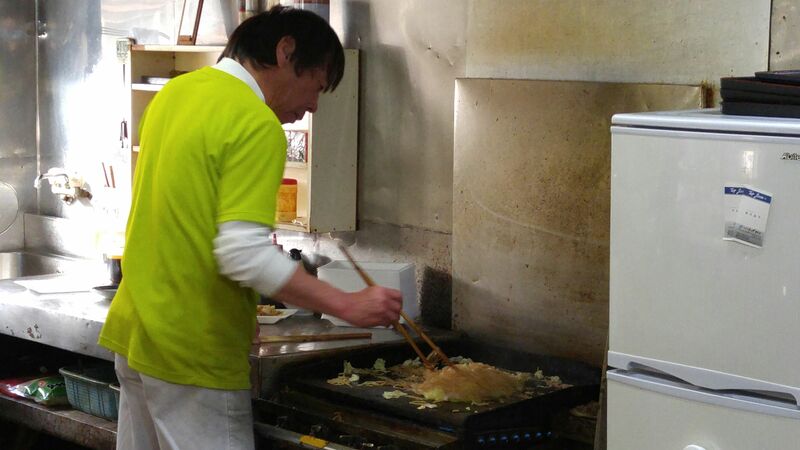 Their takiyaki are enormous by Japanese standards, The husband cook them and his wife cut them! 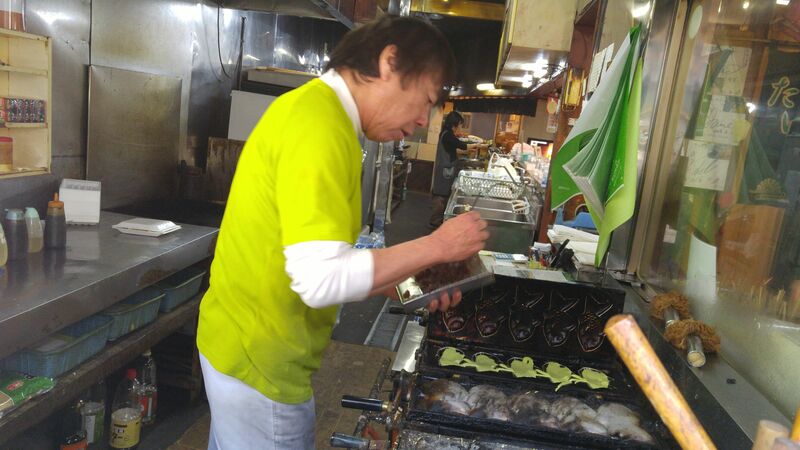 “Taiyaki” is called such because “tai” means “seabream”, a symbol of abundance, and “yaki” for “baked/grilled/cooked”! In fact they will wrapped twice! Enormous taiyaki! The green color will start fading with the decrease of temperature, so take photos of them out of the plaque! 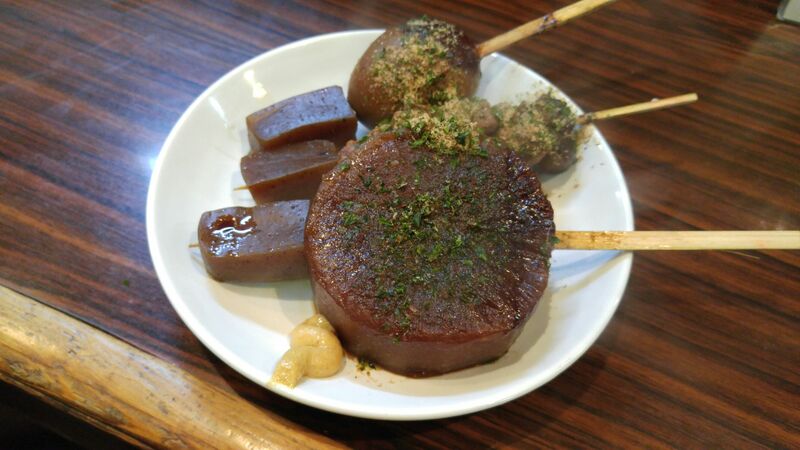 They are filled with sweet, but not cloy, red bean paste called “anko/餡子” in Japanese! 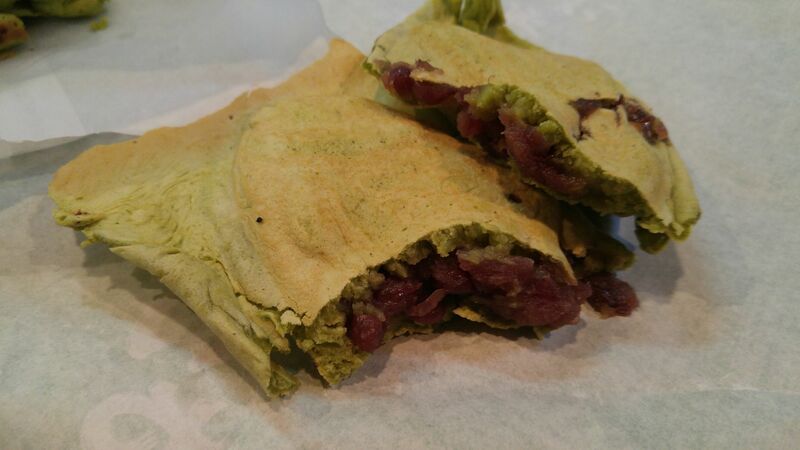 The chef explained that he tried a long time ago to fill them with white bean paste mixed with matcha tea, but it just did not work! 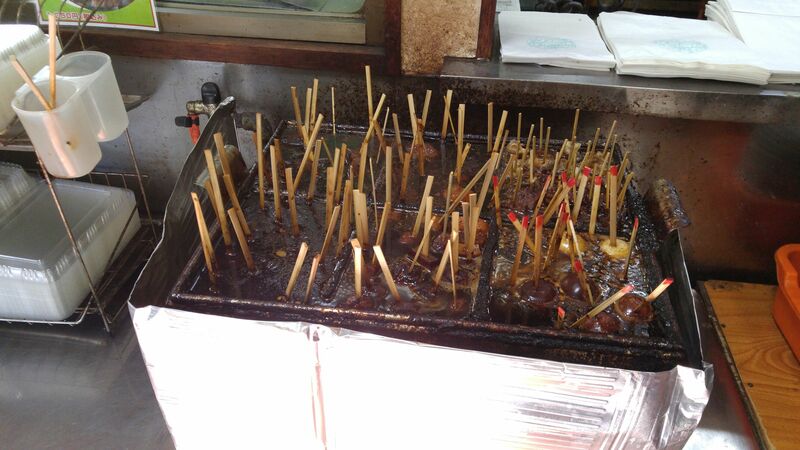 Ieyama can be cold in winter and their oden are very popular, especially the locals! 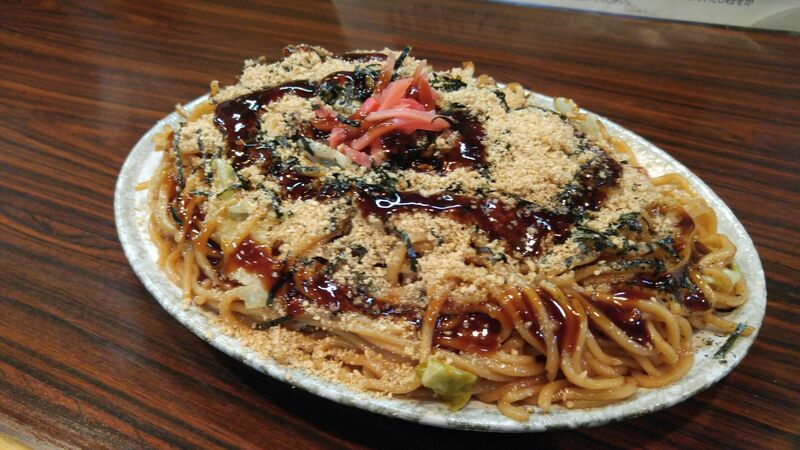 Served with “aonori/dry seaweed and dry fish” powder mixture and hot Japanese mustard in typical Shizuoka fashion! 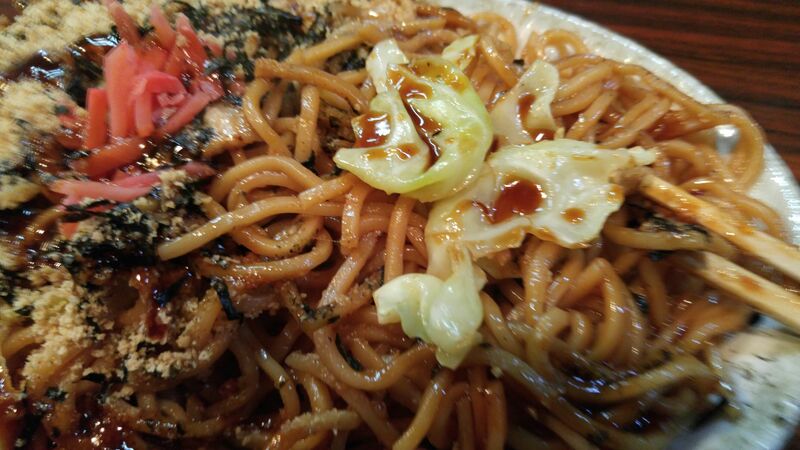 The chef just moves to another hot plate for yakisoba! 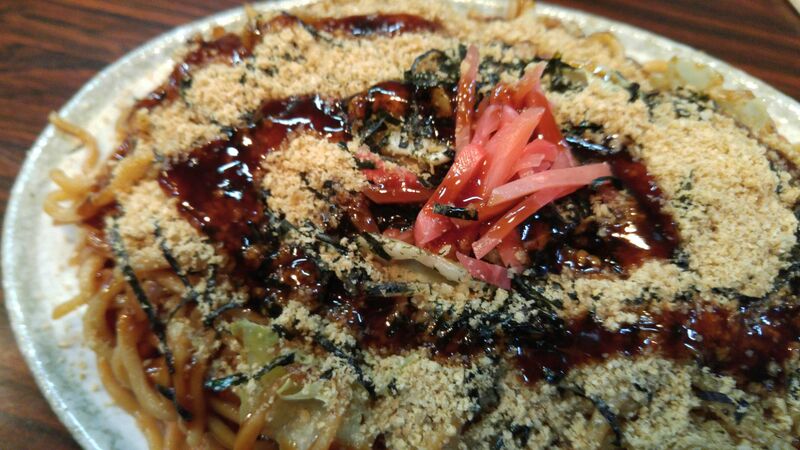 Interestingly enough, the owners expect you to share it and provide small plates for you and friends! To tell the truth I ate it all by myself! 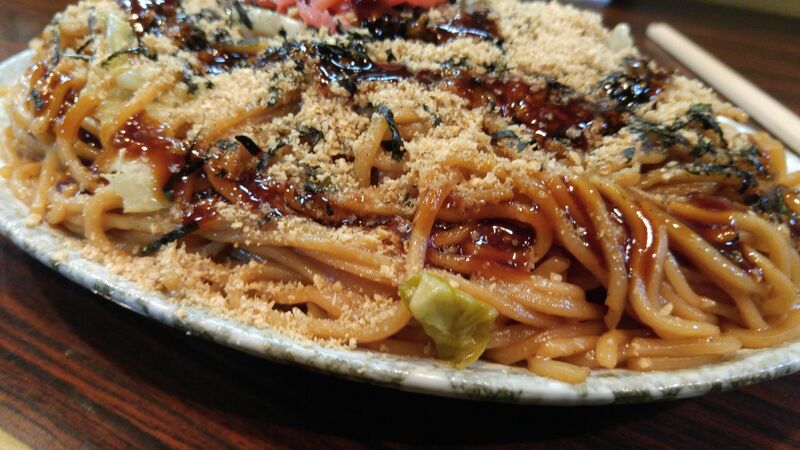 Japanese yakisoba is a cross between Chinese fried noodles and western pasta, so they should please everyone! 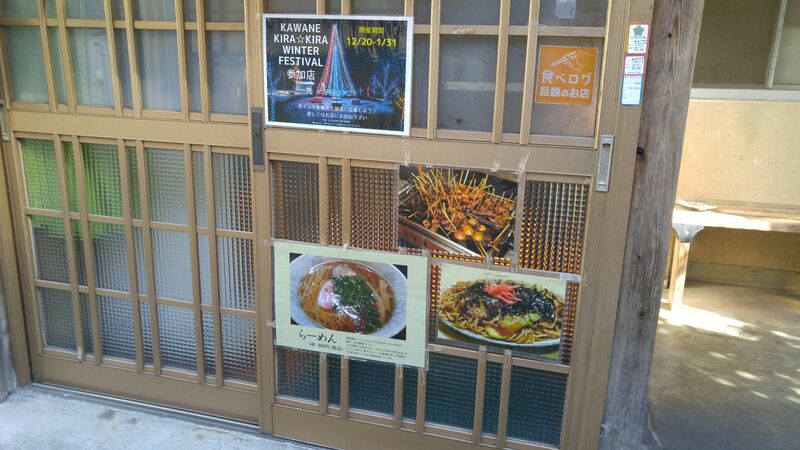 Next time I will sample their ramen!